After “Frances Ha” and Noah Baumbach’s upcoming film, “Mistress America,” it felt safe to assume the writer-director had taken on a new demeanor, because there’s a joy to those films rarely seen in his past work. As it turns out, it was wrong to presume that he was done with his days of making audiences squirm, because that side of Baumbach has returned with a vengeance. “While We’re Young” is perhaps the filmmaker’s most unpleasant picture to date, and that’s a compliment. Josh (Ben Stiller) and Cornelia (Naomi Watts) are a happily married couple. They’re comfortable with the choices they’ve made, including not having kids, but they begin to question those choices when they see the family their friends have built and, especially, after they meet a young and overly hip couple, Jamie (Adam Driver) and Darby (Amanda Seyfried). The two youngsters are wild and free, which is a lifestyle Josh and Cornelia attempt to emulate. The middle-aged couple begins to feel young again, thanks to some funky hats and hip hop dance classes, but his fantasy doesn’t last too long, as the older couple begins to realize that maybe this isn’t how people their age should be acting. 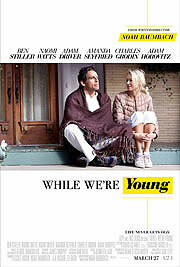 “While We’re Young” is a mix of the old and new Baumbach. It’s as cringe-inducing as his early work, but it’s also as accessible as “Frances Ha” and “Mistress America.” The film is filled to the brim with jokes and awkwardly comedic scenarios, almost to the point of exhaustion. Baumbach has recently exhibited a strong eye for pacing; he’s telling his stories with a faster pace, without ever making them contrived, rushed or any less human. His recent work is as driven by story as it is by character, and Baumbach balances the two rather nicely.